The Alfie Gough Memorial Run (5k, 10k & Children’s Fun Run) is a brand new evening event for Kent to commemorate the life of Alfie Gough and help raise funds for The Alfie Gough Trust. The race is a fundraising event and is intended to help continue the trust’s invaluable work. A choice of 10k or 5k routes is available – plus there will be a race for the children. Prizes/awards for leading runners in all age categories plus team prizes. Join our free 10k coach club to support you to achieve your 10k running challenge! Send an email to Charlie white at cw57run@gmail.com with your details and Charlie will get back to you. 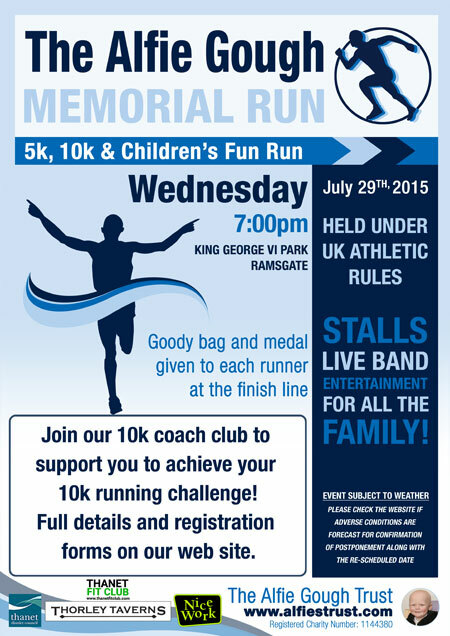 Come and achieve your first 10k with us and celebrate Alfie’s life. You can enter the race online via Runners World here. please supply any information I need to join our running group.